Sheet masks that make you look good. Where were you when the great Korean Beauty invasion began? Maybe we should start with when it happened. Sometime a few years ago, BB and CC creams started popping up at Sephora and drugstore aisles alike. The popular base brought Korean Beauty craze along with it. That means serums, essences, micellar water, and finally sheet masks! If you haven’t seen someone in a sheet mask before, prepare to be scared. 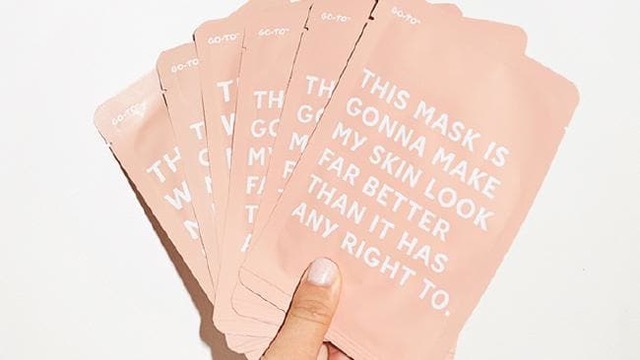 The thin cotton masks are soaked with serums that target your specific concern. Fine lines, dehydration, brightening – no matter your skin issue you can be sure there’s a sheet mask that leaves you refreshed and glowing. And listen, sheet masks aren’t going to fix everything permanently, but they’re perfect for a big night or just a little bit of R&R. Even better, I like to give them out to friends while we watch movies and have a glass of wine. For a next level skincare cheat, put them on the next time you fly. I get a lot of weird looks, but it’s totally worth it to come off the plane looking and feeling good instead of dried out and tired. Bring an extra and give it to your seat neighbor, which I read somewhere online and now do on every flight. The bottom line is sheet masks are good for your skin and good for your soul. Every woman should have a box stashed away in her bathroom whenever you need a little shuzh. Shop our edit below.